Are you up for losing about 30 pounds this year in a painless way? 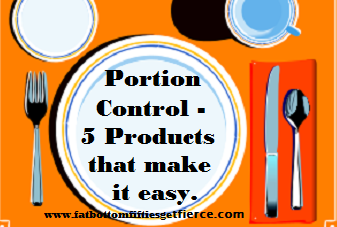 Here are 5 products – some probably already in your kitchen – that will make the portion-control goal easier. 1. Mini muffin tins. 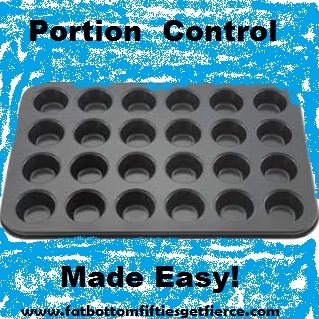 They can be used for bite-sized brownies and quiche as well as mini muffins. 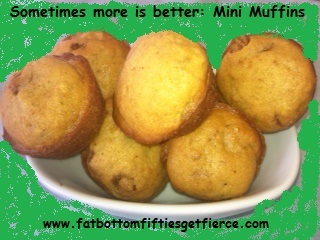 The “muffins” pictured here are actually diminutive portions of my original top-secret-recipe banana bread. Cooking the bread in the little tins left it moist on the inside with a bit of crunch on the outside. Okay – I didn’t do the crunch part on purpose, but it’s a mistake that I will deliberately make again! Bonus: you can have three of your little tasty treats and still not have the calories of one big one – sometimes more does make us feel better! 2. Ice cube trays. You’ve probably already heard about freezing left over wine (if that’s not an oxymoron) in trays to later throw into stews and gravies to enhance their flavor. Well, that’s just one of their many uses. Whether left over or taken off the top of the batch, gravy and sauces freeze well in that portion-controlled environment. Pop out only a cube or two to heat up for your reduced portion of pasta or potato. Freeze flavored yogart or smoothies for a bite of something sweet. 3. Small-Batch Baking Cookbook. You may have heard me mention this one before – I love this book. Getting fierce doesn’t have to mean deprivation. But it does mean not setting our selves up for failure. The solution? Indulging the occasional craving with a portion controlled recipe. Just enough to satisfy the sweet tooth without having the temptation of “the rest of the pie” to deal with! 4. Small scoops. This small version of the spring-loaded scoop is great for filling the mini-muffin tin, making bite-sized cookies, and creating a 3-scoop ice cream sundae that allows you to indulge without sabotaging the great progress you’re making! 5. Ziplock snack bags. Have them sitting on the counter when you get home from grocery shopping. Before putting the can of nuts or bag of Kashi Hummus Crisps away, portion them out into snack bags. Not only will it save you from overeating from the bigger package later, it will help you avoid impulse eating while out by providing a healthy, portioned out option for you to grab on the go. Bonus: Dividing up your own snack foods is a less expensive alternative to all those grocery store 100 calorie snack packs. 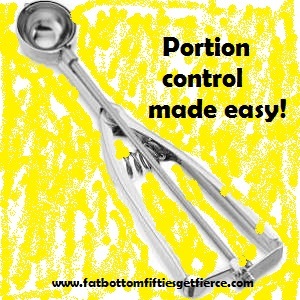 Eating less has never been easier! 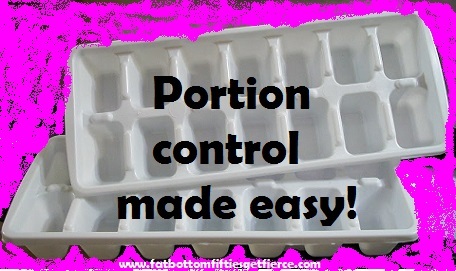 What products do you use to help with portion-control?